La collezione primavera-estate 2017, in passerella il prossimo giugno a Milano, sarà disegnata dal team creativo interno. The spring-summer 2017 collection, on stage next June in Milan, will be designed by the in-house design team. Canali e Andrea Pompilio hanno deciso consensualmente di non rinnovare la loro collaborazione creativa: la decisione di separarsi coincide con la naturale scadenza del contratto con il designer, arruolato come consulente creativo, il primo in 80 anni di storia per il brand italiano di moda maschile, nel 2014. Il team creativo interno si occuperà della collezione primavera-estate 2017 del marchio, in passerella il prossimo giugno durante Milano Moda Uomo. È probabile che adesso Andrea Pompilio, che ha precedentemente lavorato per Prada, Bally e Yves Saint Laurent, si concentrerà sulla sua etichetta maschile omonima che recentemente presentava le collezioni solo su appuntamento. 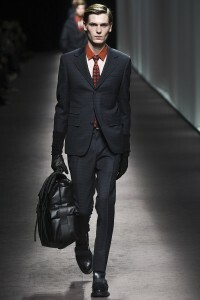 Canali and Andrea Pompilio have consensually decided to not renew their creative partnership: the decision to part ways coincides with the natural expiration of the agreement with the designer, hired as creative consultant, the first over 80 years of history for the Italian menswear fashion house, in 2014. The in-house design team will work on the brand’s spring-summer 2017 collection which will be presented this coming June during Milan Fashion Week. It is likely now that Andrea Pompilio, who previously worked at Prada, Bally and Yves Saint Laurent, will focuse his attention on his eponymous menswear label which has recently unveiled the collections by appointment only.